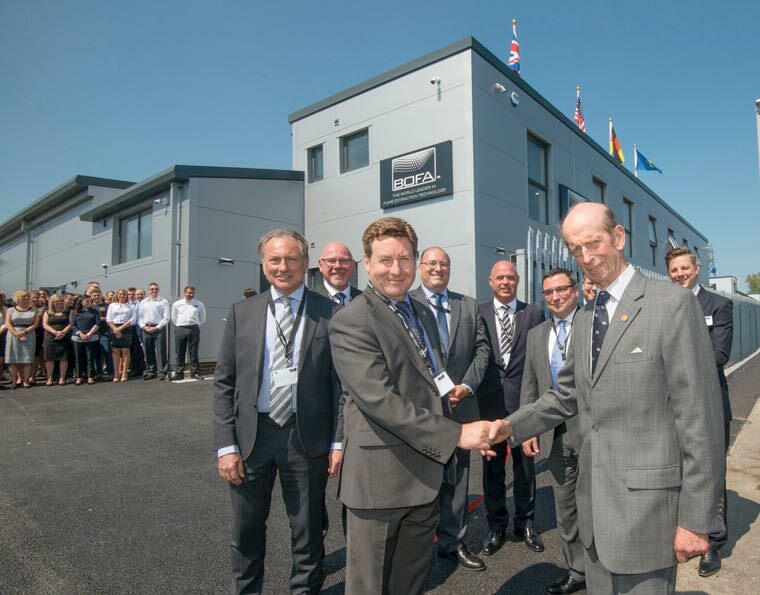 His Royal Highness The Duke of Kent officially opened a new state-of-the-art corporate head office in Poole for BOFA International, a world leader in industrial fume and dust extraction technology. The visit by His Royal Highness to officially open the BOFA International’s new 12,000 sq ft premises acknowledges the company’s remarkable success since a management buy-out in 2015, during which time it has grown its export markets to over 120 countries and achieved recognition of its technological leadership through a Queen’s Award for Innovation. The new building is home to corporate services, but will also house one of the world’s most advanced fume and dust extraction research and development facilities. BOFA is one of the fastest growing businesses in Dorset in the design and production of fume and dust extraction systems that remove harmful airborne contaminants associated with industrial processes. It employs over 250 people. The company’s footprint in Poole has been increased by 25% by the new building, and includes an R&D facility to support the work of BOFA’s 14-strong specialist team of chartered engineers and technicians. This technical excellence was acknowledged through the Queen’s Award for Innovation in 2017 for the company’s development of its Intelligent Operating (iQ) platform – a world ‘first’ that brings new levels of monitoring, analytics and control to extraction system performance.